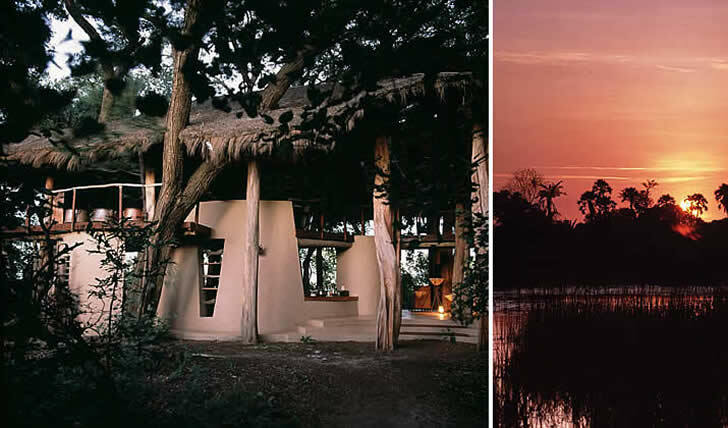 Sandibe�s earthy design communicates an easy relationship with nature, blending effortlessly with the thick reed beds and towering trees of the immediate surroundings while also providing for three of the most important luxury safari requirements: privacy, security and comfort. For visitors to Sandibe Safari Lodge in Botswana, the experience begins while flying over semi-arid savannah grasslands that gradually morph into the emeraldgreen patchwork that is the Okavango delta from the air. This inland river delta � the biggest in the world � is referred to in ancient tradition as the river that never finds the sea and its lagoons, islands and channels form the habitat of a vast array of animals and plant life on a slowly meandering path that ends in the Kalahari desert. Sandibe, located on a permanent channel in the delta overlooking the Santantadibe river, is adjacent to the world-famous Moremi Game Reserve and functions as a thoughtfully conceived man-made habitat for the two-legged species that come to observe the natural splendour of this fertile wetland wilderness. Furthermore, any saplings that needed removing were carefully transplanted into the surrounding forest. While the aesthetic directives called for in the original brief from client are evident in the traditional adobe-style, thick mud walls (bringing to mind the giant termite hills that are such an intrinsic part of the scenery) and subtle pan-African references (such as the rondavels, or round private cottages), the architect garnered much of his inspiration by living on the site for several months before construction began. For hundreds of years herds of elephant have walked the paths that run through Sandibe, a phenomenon witnessed by the architect and one that provided further motivation for the design team not to alter the face of the landscape in any way. All the building materials, including thatch and wood (which have a natural tendency to weather and thus blend into the environs) as well as large swathes of glass were chosen to harmonise with nature and set the buildings within the surrounding vegetation, not on top of it. The resulting transition between indoors and out is one that is absolutely seamless. Guest areas are for the most part open to the elements and are defined by levels: a top-floor library, ground-floor dining room and generously proportioned, sunken sitting room, all tucked beneath a soaring canopy of trees. Shaded decks slung with hammocks afford views across the peaceful waterway and to the grasslands beyond. 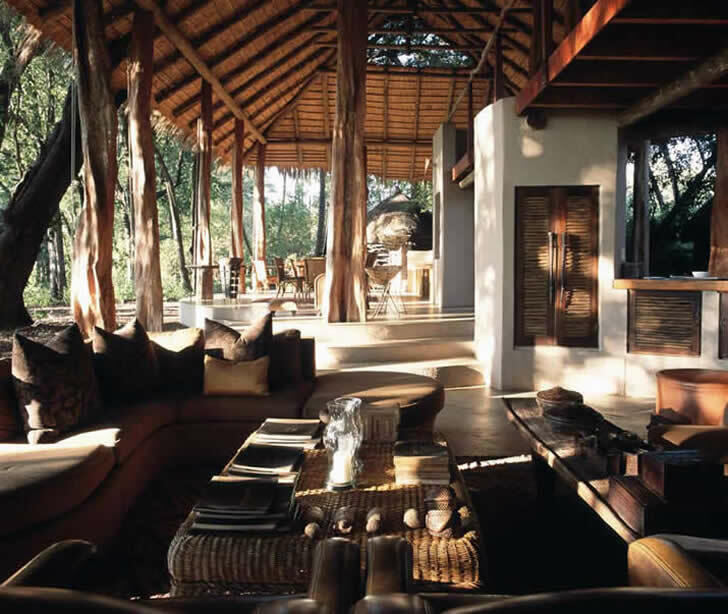 The interior style of Sandibe is described by Conservation Corporation Africa�s design custodian Chris Browne as �Organic Delta�, his starting point for the decor inspired by the large marquesia-tree columns that support the roof of the main guest areas. 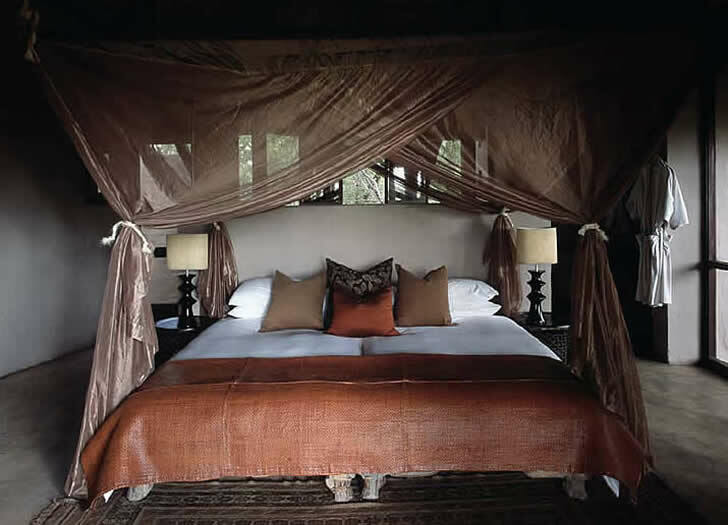 The burnished copper colour of their bark has taken root on decorative items such as oversized hanging lanterns, picture frames and ethnic anklets as well as soft furnishings, including the copper-coloured mosquito nets that feature so prominently in each cottage. While the additional earthy tones of chocolate, toffee and clay affirm the rustic nature of Sandibe, it is these glints of copper that serve to inject a sense of glamour and subtle shine. More evidence of the organic influence is apparent in the thick, woven textures on flat surfaces, a handful of carvings and the appealing handcrafted imperfection of Botswana basketware and gently worn leather bedspreads. Just as the Okavango river is in no hurry to get to its final destination, visitors to this particular part of the delta are reluctant to leave this watery wonderland and the warm, welcoming oasis that is Sandibe Safari Lodge.